No, not me. This couldn’t be happening to me. I was standing at the airport ticket counter, being told “the next flight available is on the 26th.” That was not okay. It was December 23rd. And as my throat swelled and tears threatened to spill over, my mind rebelled at the possibility of being alone in Phoenix for Christmas. Let me back up. It was December 2006, and I was a 22 year-old graduate student at the University of Oregon. 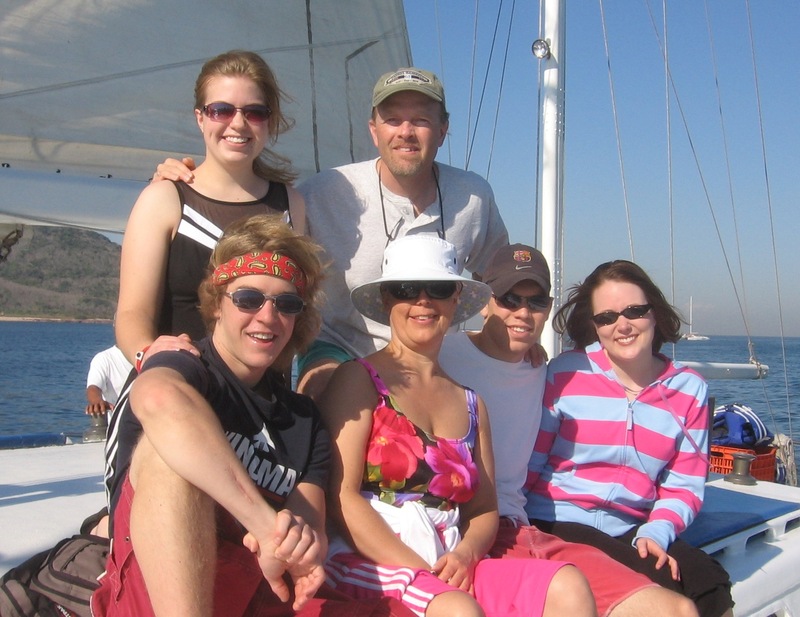 A native Minnesotan, I was eagerly looking forward to Christmas in Mazatlan, Mexico, with my mother’s extended family – Grandpa and Grandma’s treat holiday vacation to celebrate their 50th wedding anniversary. It was especially important for us to be together because we hadn’t seen each other since Mom and Dad dropped me off at grad school in July. After finals, I flew home to Minnesota for a few days before we were all booked to fly to Mexico. Grandpa had arranged for everyone to fly together, except for me, as I needed to fly back to Minnesota a day early in order to be at a close friend’s wedding. No problem, though, as I was used to traveling alone and relished my independence. I was to depart Minneapolis just a few hours before my family, stop for a quick layover in Phoenix, and then rendezvous with them in Mazatlan. Except Phoenix had severe fog. (Who knew Phoenix ever had severe weather?!) And as the plane was literally touching down, it took off again. Uh oh. Not good. We were re-routed to Tucson where we spent three hours grounded on the tarmac with a zillion other planes, trying to get by on a pack of peanuts and hopes that our delay wouldn’t ruin the holidays. I was optimistic, though, as my flight out of Phoenix wouldn’t depart for a few more hours. I had time. No sweat. When we finally landed in Phoenix, we were told that instructions regarding our connecting flight would be available inside the terminal. As I exited the plane, the terminal was a zoo. The line leading up to the airline’s information counter was literally several hundred people long. And not moving. No instructions. I heard some people say the lines were shorter downstairs at the ticket counter. So I gambled the extra time it would take to re-enter through security and left the line. The ticket lines were crazy, but I finally made it up to the counter. Only to find my flight had been cancelled and to hear those words: “The next flight available is on the 26th.” What? No re-scheduled flights? No plane waiting for me right now? Not even today? NO WAY. Not okay with me. I could NOT spend Christmas stranded in Phoenix by myself. I said no thanks. I frantically called my dad, trying to be a big girl and not cry. He along with my uncle and Grandpa were about to depart Minneapolis, and were desperately scrambling to find out what they could to get me down to Mexico. But I knew they couldn’t help me. It was up to me. Well, God, really. I took a breath. I got back in line for a ticket. After seemingly a century of nervous waiting, a customer service lady–who I swear is an angel–spent 30 minutes finding me a flight with another airline. She found me a flight on a Mexican airline that would leave the next day. She transferred my ticket, gave me a hotel voucher, and told me to go to the Mexican airline counter. I went. Waited in line again. Got my new tickets, which required a quick transfer in Hermosillo, a city in Mexico I had never heard of. I found my way to the luggage counter. Waited in line behind 100 other stressed-out customers wanting to be home for Christmas. Showed them my ticket, and prayed to God that my luggage would find its way to Mexico. I called the hotel, waited for a shuttle, and it drove me through the strange darkness of Phoenix to my bed for the evening. I was issued coupons for breakfast, and crashed in my room. I called my family briefly, with the remaining cell phone juice I had left. (Don’t ever pack your charger in your luggage, by the way.) Then I cried. What if I didn’t make it tomorrow? What if the flights got screwed up again? My layover in Hermosillo was brief. What if I got stranded in a strange Mexican city? I was so close to not making it to be with my family for Christmas, I could hardly breathe. And then I slowed down long enough to listen to the Holy Spirit. And he asked me, “Katherine, why do you celebrate Christmas?” And my answer, of course, was to celebrate Jesus’ birth. And did I need my family to do that? No. I didn’t. Jesus was with me. He was my everything. In a moment where I felt stripped, vulnerable, and alone, He was there. And He challenged what I had grown to hold the dearest at Christmas time–my family. In a culture of materialism and humanism, it is actually a good and noble thing to make family your priority at Christmas, instead of gifts, parties, social statuses and explosions of Pinterest projects. But here I sat on my scratchy hotel bedspread, and God said, No, Katherine. I am to be your Number One, especially at Christmas. This Christmas is not about getting your beach tan or body surfing with your brothers. It’s about Me. Your life must be about Me, or else your life will be empty. You can have all of these other things, but without Me you will not be living. And I knew that even if I had to be alone at Christmas, it would still be Christmas. Even if I spent it alone in a hotel room, reading the Christmas story and singing carols by myself, it would still be a celebration. I could worship my God anywhere, and I didn’t need a tree, living room, or family to do it. I resolved to have a good Christmas, and fell into a fitful sleep. Well, on Christmas Eve I made it to Mazatlan. And it was truly a miracle, because as I visited with other stranded passengers, NO ONE else got a free hotel voucher. Hardly anyone else found a flight to their destination in time for Christmas. On my flight to Hermosillo, the Lord sat me next to a kind man–also headed to Mazatlán–who was bilingual, which was awesome because I didn’t speak Spanish. He guided me through the foreign airport. Our flight arrived late, but they held the plane in Hermosillo, let us budge in line through customs, just in time to make our flight to Mazatlan. When I arrived, my family was there waiting for me. And so was my luggage. So that’s how I got my Christmas miracle – the gift of my Lord and Savior. And that year, he gave me the extra blessing of spending it with my family.